The MODIS Terra+Aqua Combined Land Cover product incorporates five different land cover classification schemes, derived through a supervised decision-tree classification method. The primary land cover scheme identifies 17 classes defined by the IGBP, including 11 natural vegetation classes, three human-altered classes, and three non-vegetated classes. The Land Cover Dynamics product includes layers on the timing of vegetation growth, maturity, and senescence that mark the seasonal cycles. 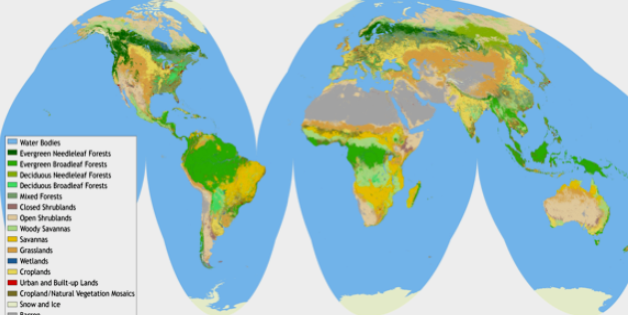 Estimates of vegetation phenology are provided twice annually from the two 12-month focus periods, July-June, and January-December, allowing for hemispheric differences in the growing seasons, and enabling the product to capture two growth cycles if necessary.